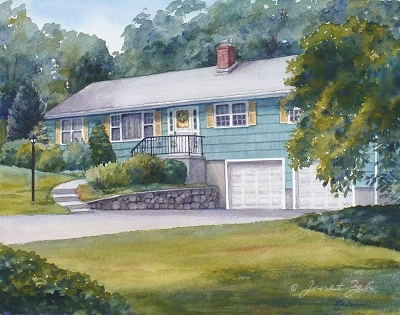 A home where children have grown up holds a lot of emotion for a family: fond memories of parents, siblings, holidays and all the events of childhood. 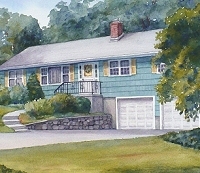 It is especially poignant when the children have grown, the parents have moved to assisted living or have passed away. 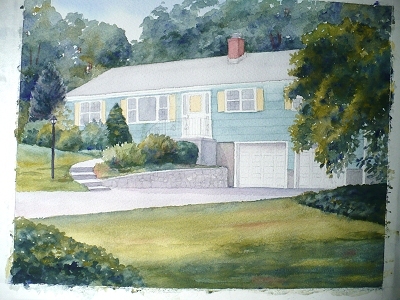 The request for this home portrait came from such a family - they remember their home with great fondness and wanted to give a painting of it to their mother after the house was sold. The only photos they had of the house when she lived there were of the house buried in 3 feet of snow. She is not fond of snow, so I had to do some changing! They asked for a view from an angle rather than straight-on. So I used one of the current photos to make a nice composition. 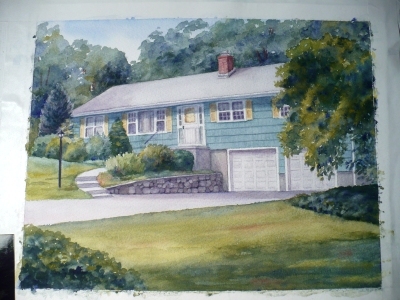 I start by painting the sky, then decide to do all the green of the trees, shrubs and lawn using mixes of blue and yellow paint. I keep the background trees more on the blue side to visually push them back in space. 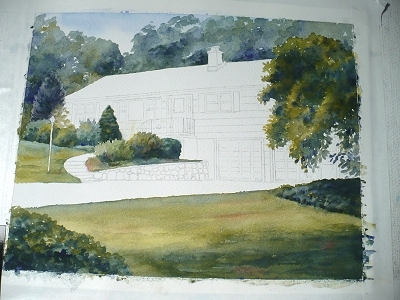 Below I paint the lawn and am adding cast shadows in the foreground. 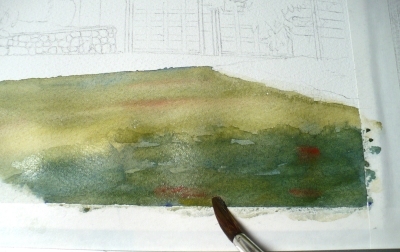 I mix greens from yellow and blue paint and add a few red streaks here and there into the wet paint. 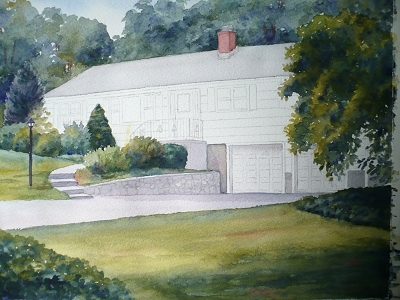 Next I paint the gray stones, cement areas, walkway, driveway and roof. 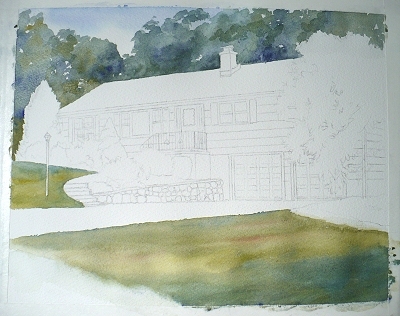 This is an initial wash of paint with no details added yet. 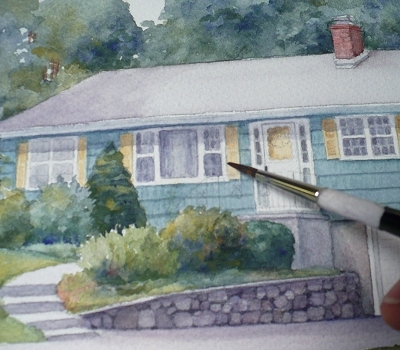 I use a mix of blue and burnt sienna to make the gray with a touch of rose added. 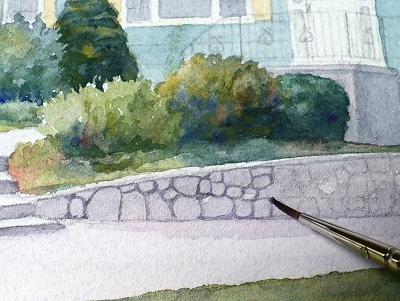 For the stone wall (I love painting stones! 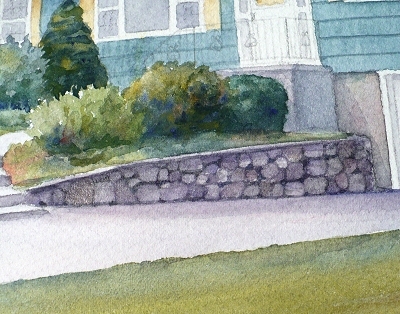 ), I first outline the stones with a darker gray that I've mixed. 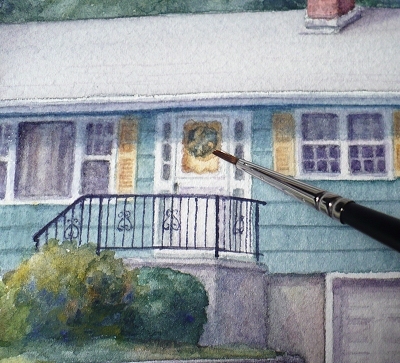 After a few more adjustments of light and dark and another wash to deepen the color of the siding, the painting is finished - just in time for Christmas!